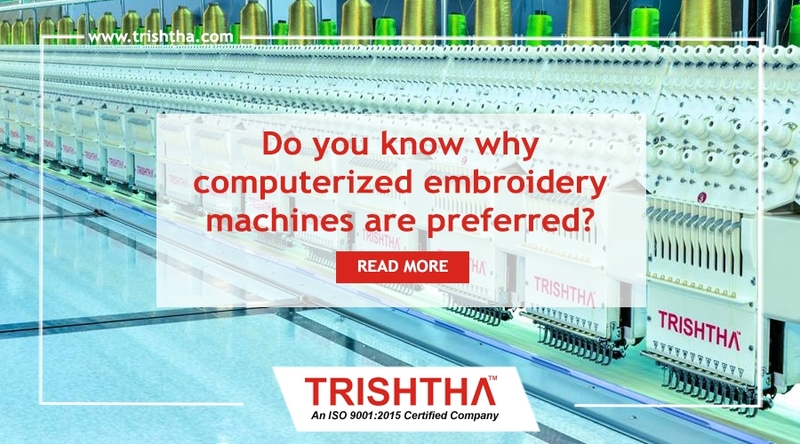 Do You Know Why Computerized Embroidery Machines Are Preferred Read On - Trishtha Industries Pvt. Ltd.
Do you know why computerized embroidery machines are preferred? Read On! Thanks to the latest and evolving technologies, embroidery is no longer as difficult and time consuming as it once was. When embroidery was done by hand or with the use of traditional sewing machine, it would take hours to finish one design. But, today, computerized embroidery machines have managed the way embroidery was done forever. Whether for your professional or domestic projects in your studio or at home, Trishtha is the computer embroidery machine dealer in Kolkata who can fulfill all your machine requirements. Keep reading to know why our machines are sought-after. With a computerized machine, all you need to do is choose and correctly load the design in the machine. Also, you need to properly position the fabric. Then, the machine will work as per your instructions and create a flawless design. So, all you have to do is supervise the work and deliver it to your customers once they’re done. Computerized embroidery machines are easy to use and no prior knowledge or skills is necessary for handling these devices. This is what makes these machines perfect for beginners. However, we do provide manuals with all the information you need. Embroidery machines like, 9, 12 or embroidery machine 23 head allow you to complete the most sophisticated and complex of designs in almost no time at all. This enables you to run a successful embroidery business right from home without having to invest in manual labor. Also, these machines let’s you accept orders of large quantities without any fear. With our cutting-edge machines, you can take your embroidery business several notches higher. Trishtha’s computerized embroidery machines allow you to create your own personalized designs and patterns. You can also edit ready-made designs to give it your personal touch. So, interested? If you want to place an order or have more questions, do not hesitate to get in touch with the veteran computer embroidery machine dealer in Kolkata, Trishtha. We will be happy to clear all your doubts. wh0cd10128 kamagra Xenical cialis price Ventolin Diskus lasix sildenafil drug valtrex 500 mg wellbutrin prices where can i buy corticosteroids pills?